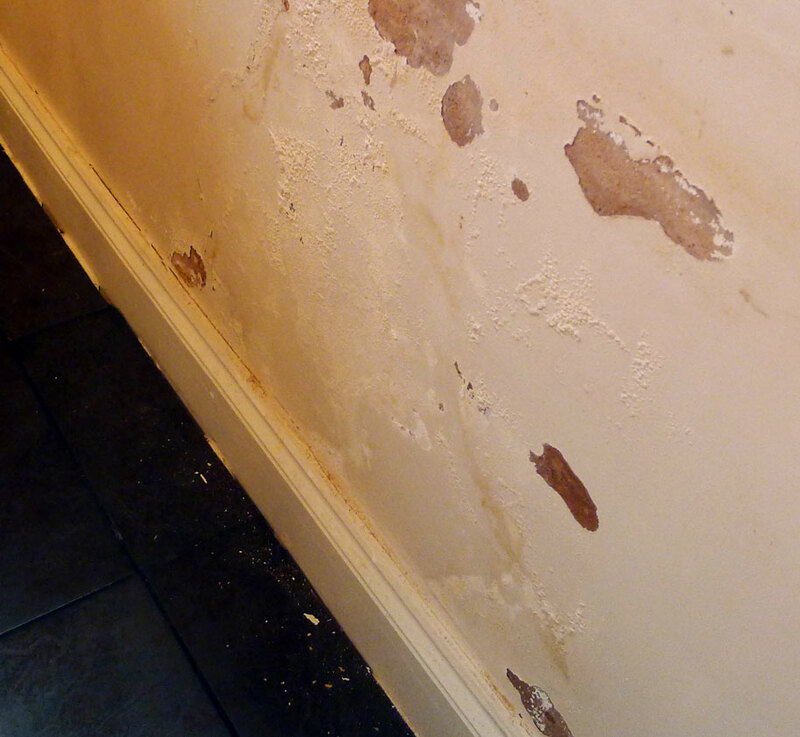 Earlier this year, we were faced with the unmistakable signs of damp seeping up through the floor in the utility room. This is not the first time we’ve had this problem and as a result, we now feel we know more than we ever wanted to about this subject. So here, for fellow sufferers, are my top five tips for protecting your house from the effects of moisture. It is all too tempting to hope that something unpleasant, like a damp patch in the corner of the room, will magically go away of its own accord. It’s not going to happen, and the longer you keep ignoring it, the bigger the problem you are storing up for yourself. Part of the problem in the utility room was that we had failed to think ahead when installing the laminate floor. We have since discovered that there are all sorts of flooring underlay, and while all of them offer a degree of protection against damp, some are better than others. For example, if the flooring is going onto a concrete base at ground level, you really need a plastic damp proof sheet, whereas elsewhere, you might use something that looks more like conventional insulation. Have a good chat with your local supplier and make sure you get the right material for the job. If you keep your home well ventilated, then condensation gets very little opportunity to build up. Make it part of your daily routine to open the windows and let in some fresh air. The house will feel like a nicer place anyway. Even in colder weather, it is still worth doing. You don’t have to leave them wide open for hours. If your kitchen or bathroom is particularly prone to condensation, you could also think about getting some additional air vents put in. Speaking of air vents, it is always a good idea to check they are clear. If there is a piece of furniture pressed up against a vent, it has no hope of working properly! If all else fails, a dehumidifier will definitely do the trick, and they are not expensive – you can pick one up for less than £100. You will certainly notice an improvement in air quality. The only word of caution here is that this is a solution to the symptom rather than the underlying problem. Here’s a tip that I picked up from one of the many people who were quick to offer advice on our moisture problem. If the grout in your kitchen, bathroom or utility room is old or cracked, it will let in extra moisture. More moisture means more damp and a bigger problem. Regrouting your tiles is a simple task that can be done over an afternoon. The materials are cheap, and as well as reducing your damp problem, it will make your tiling look like new. I hope these tips provide a little inspiration in solving your moisture problems – good luck!